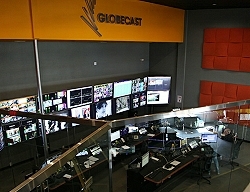 Globecast in France demonstrates Live Remote Production service. Paris, December 2016: On 30th November, for the first time Globecast and Imagina France demonstrated Live Remote Production service. This Remote Production offering turns the concept of the traditional supply of a ready-to-broadcast feed from venues on its head. This demonstration brought multiple signals from a French League 1 match from which programming was then created remotely. The broadcast was of the French League 1 football match between Bastia and Bordeaux. Images from five dedicated cameras and their associated signals (CCU, tally, intercom, etc.) were sent from the Bastia stadium (in Corsica) to the Imagina France production truck in Boulogne (near Paris). This was acting as central production unit where the director and his team operated. Signal transport was provided by Globecast via a 1Gbps link, with a total latency of 100ms in JPEG2000 and 350ms in H.264. Allowing live programmes to be produced remotely from places where events occur regularly - stadiums, racecourses, theatres etc. - opens up new possibilities for broadcasters and rights holders. Providing multiple raw feeds facilitates the production of diversified content. Moreover, the availability of multiple sources at a central production site allows the production of a variety of programme formats of the same event at lower cost, which optimises monetisation. By demonstrating the feasibility of a fully remote production of a major sporting event from a location with strong technical and logistical constraints, Globecast and Imagina France have proved that it’s possible to provide the market with packaged or customised solutions that meet content providers’ needs.